The Merlin’s roar reverberated throughout the valley as the Spitfire raced for home. Flying Officer Al Harley looked down briefly upon the scene below. A stricken “bird” was lying broken and forlorn, the remains of it’s last target, a flak emplacement, smouldered nearby. As Harley flashed past, he noticed the grey-clad soldiers running towards the now silent Spitfire Mk Vb. Even with the blur of speed, he could clearly see the codes on the fighter’s fuselage, “RS-T.” His element leader, the commander of the crack Biggin Hill Wing was down, finally vanquished after three years of war. It was January 28, 1942 and the pilot of the downed aircraft was an RAF legend. 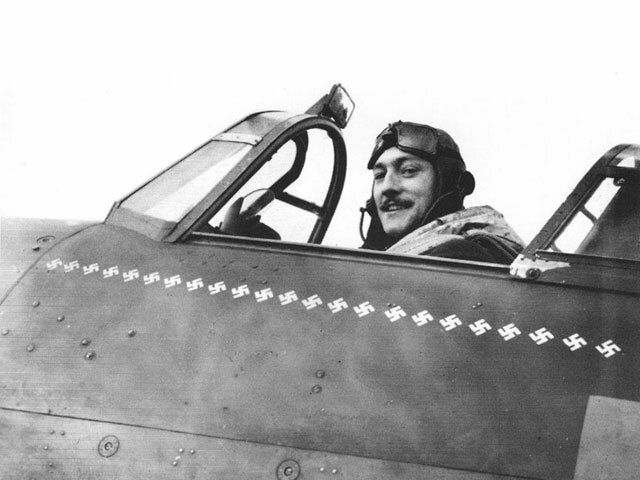 Wing Commander Roland Robert Stanford Tuck, attempted to shield the twenty-nine swastikas painted on his Spitfire from the menacing gaze of the rapidly advancing German troops. Those little white, crooked crosses, insignificant as a single entity, each marked a victory over an enemy pilot in his machine. Combined, they were mute testimony to hundreds of hours scanning the heavens with tired, streaming eyes and savagely fighting for the life of the individual in the cockpit and for the nation that refused to yield to the overtures of a tyrant. On completion of pilot’s course, Pilot Officer Robert Stanford Tuck was posted to 65(F) Squadron to fly Gloster Gauntlets and Gladiators. He was promoted to Flying Officer during 1938 and was selected to represent 65SQN on the Spitfire conversion course to be held at Duxford. The first Mk Ia that he flew was K9796 and it is safe to say, that it made a lasting impression on the young aviator. He returned to 65SQN on January 9th 1939, as one of the RAF’s first qualified Spitfire pilots. Following the outbreak of the second world war, he was made a flight commander in that unit. The first Spitfire is marked as FZ o L, K9906 during May 1939; this was one of the earliest squadron-assigned Spitfires flown by RST. It is in the standard pre-war colour scheme of Dark Earth and Dark Green in the “A” pattern camouflage, with painted Aluminium lower surfaces. I used Gunze paints for the upper surfaces, with Testor's Aluminium non-buffing metaliser for the lower surfaces. · Pole type antenna mast made from brass tubing. · Addition of a ring sight from Eduard. · Modification of the pitot tube to the early twin-probe type. · Chassis retraction selector box replaced with hydraulic hand pump and selector lever. · Deletion of the voltage regulator. An excellent photo of this aircraft appears on Page 38 in “Combat Legend. Spitfire Mks I – V” by Peter Caygill (2002, Airlife Publishing Ltd). This clearly shows pertinent modification details and depicts the aircraft with the serial repainted in miniature on the fin. On May the 1st 1940, RST was posted to No 92 Squadron under the command of Squadron Leader Roger Bushel. This gallant officer was to become legendry as “Big X” at Stalag Luft III and led the famous escape. He was one of sixty executed by the Gestapo upon their recapture. 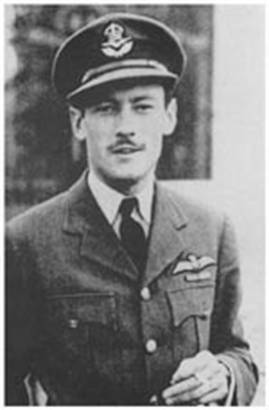 Tuck was promoted to the rank of Flight Lieutenant and appointed as a flight Commander by Bushell. During the frenetic activity of the Dunkirk evacuation, RST gained the first of his aerial victories, a Messerschmitt Bf-109, on the morning of May 23rd and added two Bf-110s during the afternoon. However, his final victim of the day had also scored, with Tuck being forced to “dead stick” his battle-damaged Spitfire on to the grass verge in front of the Hornchurch control tower. The elation from his victories was short-lived, with the news that the squadron had suffered heavily, almost half it’s strength had gone, including the Commanding Officer. Group Captain “Daddy” Bouchier made the decision to give Tuck the squadron. Under RST’s leadership, gone were the out-dated Fighter Area Attacks and tight, three-ship “vic” formations became a thing of the past. His personal score began to mount over the coming days. His bravery and skill was recognised, with the award of the Distinguished Flying Cross on June 11th. His Majesty King George VI presented his award at a ceremony at Hornchurch, on June the 28th. It was to be the first of many meetings with royalty. 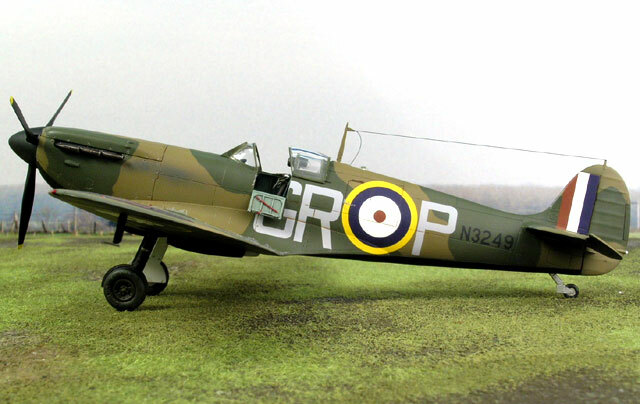 The next Spitfire is marked as GR o P, N3249 during May 1940. This aircraft is believed to be the Spitfire flown on May 23rd, when RST gained his initial victories. It is depicted in the standard “B” pattern camouflage scheme of Dark Earth and Dark Green. However, as an additional recognition feature adopted in late 1939, the undersides of the aircraft were divided evenly along the fuselage centreline, with the port side being painted in Night and the starboard in white. Polly Scale Dark Earth and Dark Green were used, along with Tamiya Flat White. The “Night” was mixed from Tamiya Dark Red and Flat Black, after reading Brett Green’s excellent Tamiya Spitfire Ia review on HyperScale. · The exhausts were replaced with items from Ultracast. · Decals were again from the outstanding Victory Productions set. They say that 20/20 hindsight and zero groundspeed is a beautiful thing. I would agree. Using this reference, I believe there is sufficient evidence to question this scheme, for the timeframe involved. Pg 29 shows a photo of RST, with P/Os Holland and Wright, standing in front of Spitfire GR o U. It has the Night port wing, starboard wing (probably) in white, with the remainder of the fuselage underside appearing to be a vastly different shade. Initially, I had suggested Duck Egg Green for this area, which was incorrect. Through the wonders of international e-mail, a couple of very kind readers informed me that the colour should be painted Aluminium, as DEG (Sky) was not introduced until later in the year. As to the armour plate, I added the armoured glass windscreen, as well as the seat-back armour. On re-reading “Fly For Your Life” by Larry Forrester (again, after model completion), Tuck states that the armoured windscreen was only fitted just prior to the afternoon sorties on the 23rd of May and, was the only armour the aircraft had at that stage. Cest la guerre. Anyway, I am happy with the final result and the scheme is pleasing to the eye. On the 15th of the month, in his first sortie leading the squadron, he shot down a Bf-110 and claimed a Bf-109 as a probable. During September and October, he continued to score freely as the Battle of Britain drew to a close. He was awarded a well-deserved bar to his DFC on the 25th of October. More victories during December capped-off a successful year, with his personal tally standing at 18 confirmed. The new year of 1941 was celebrated in style, with the news that he had been awarded the Distinguished Service Order for his outstanding leadership and personal courage. Once again, His Majesty presented the coveted award, along with the previously gazetted bar to the DFC. By coincidence, exactly one year later at that very hour, he was shot down in France. Victories were gained by day and night, as the reputation of 257 Squadron, and its celebrated leader grew. A second bar was awarded to his DFC. Tuck becoming the second RAF officer to achieve this feat. 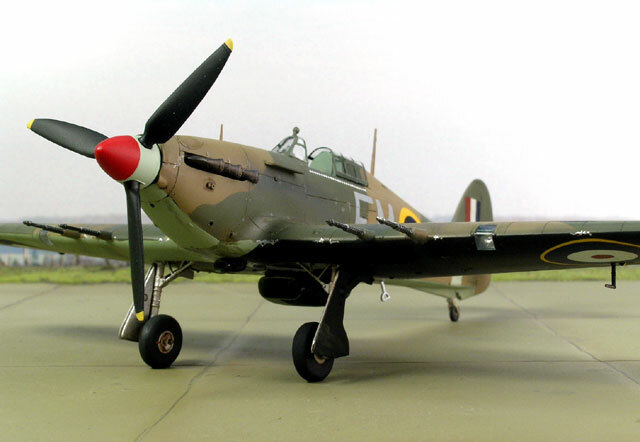 During April, the squadron re-equipped with the cannon armed Mk IIc Hurricane. Tuck had always been a vocal critic of the Browning .303 machine gun and welcomed the chance to use four 20mm cannon against his foe. On June 21st 1941, RST was flying Z3152 when he became involved in a pitched battle with Bf-109s. He managed to shoot down two of his attackers and damage another, before he himself was shot down into the English Channel. Following more than two hours adrift in his dinghy, he was picked up by a coal barge and returned to Gravesend, cold, wet and with 28 victories now to his credit. Firstly, there is Hurricane Mk Ia, DT o A - V6555. This was the first Hurricane assigned to RST when he took command of 257 Squadron. It had a small caricature of Churchill on the port side below the cockpit and, was the first to display victory markings. Ultracast supplied the seat and back armour (48019). Decals came from the Aeromaster Battle of Britain Special Set and were sent to me by Scott Taylor of Canada. Master modeller Tom Cleaver supplied the early DeHavilland propeller and spinner. 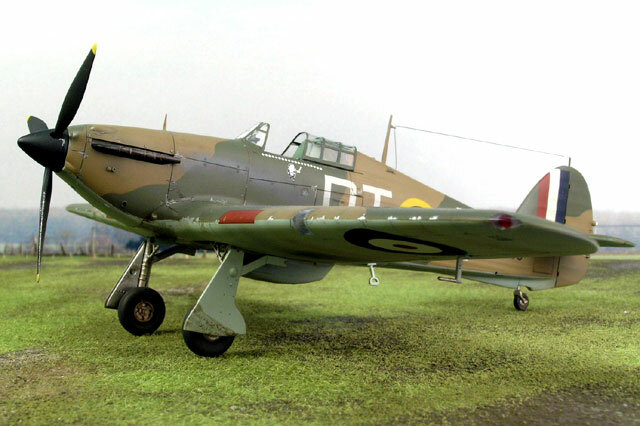 Secondly, there is RST’s most famous Hurricane Mk Ia, DT o A - V6864 (in which the photograph to the left is taken). Tuck flew this aircraft as his regular mount from December 1940 through to April 1941, following a sortie where V6555 suffered an extreme case of German-induced lead poisoning! Once again, Hasegawa supplied the basic kit. In this case, it was the Mk Ia “Squadron Leader” special, which came with markings for V6864. Gunze paints were sprayed in the “B” scheme on the upper surfaces. The repainting in Night of the underside of the port wing was reintroduced in late 1940 early ’41. The undersurfaces were painted with Tamiya Sky and the Night mixture. At this stage, it was also directed that a sky band be applied to the empennage. This was duly applied using Testors Sky to give the slight contrast that was apparent in photos of V6864. There is also much conjecture as to the colour of the Rotol spinner on this aircraft. After examining many photos, I decided to use white rather than sky, along with the red. I used the Eduard PE Zoom set (FE108) for extra cockpit details…looking back, this was a waste of time as the Hasegawa base product is excellent. Ultracast again supplied the replacement exhausts. 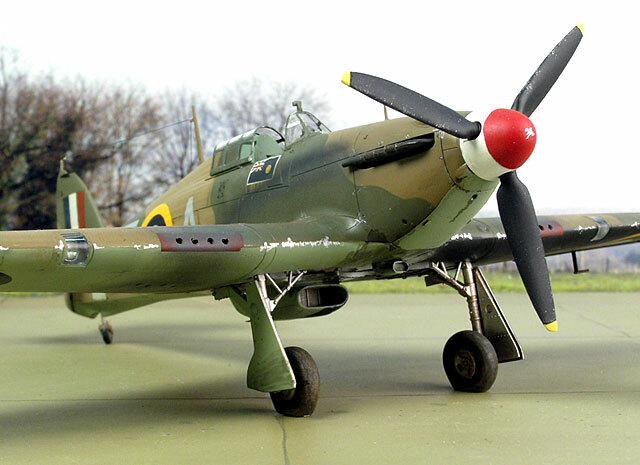 Ultracast Hurricane resin control surfaces (48042) were added to “animate” the airframe. I ensured that the control column was modified to display the correct control displacement. 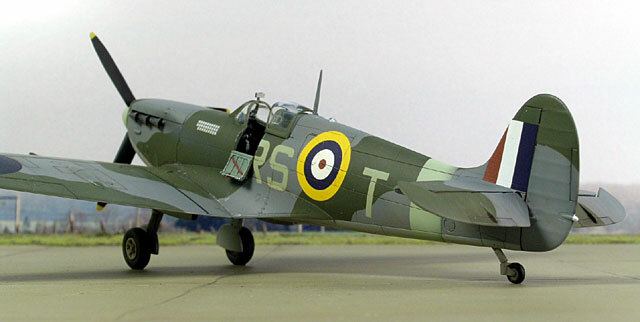 The final Hurricane is the Mk IIc, FM o A – Z3152. During 1941, 257SQN codes were changed from the well-known DT. It is thought that only one photo is available of this aircraft. Unfortunately, I did not receive permission to include it in this article. The Revell boxing of the Hasegawa Mk IIc was used. The armour plate and seat were replaced, as per V6555. Ultracast Mk II “fishtail” exhausts (48044) were used. Decals were a mix-n-match from various manufacturers and were donated by a number of very-kind readers of Hyperscale. In addition, I used codes and serials from the Tally Ho Decal sheets. In mid July of 1941, just a few days past his twenty-fifth birthday, Tuck was given command of the Duxford Wing comprising Nos 601, 56 and 12 Squadrons. An eclectic mix of aircraft was available for the new wing leader to fly. 601 were in the process of re-equipping with the American Airacobra, 56 were converting to the Typhoon and 12, better known as the Third Eagle Squadron, was happy with their Spitfire Mk Vbs. During his brief tenure at Duxford, a Bf-109 fell to the guns of his Spitfire – 29 down. He was believed to be the RAF’s highest scorer at that time. As the old saying goes, “all good things must come to an end” and the AOC of No 12 Group, Air Vice-Marshal Saul, informed him that he was being taken off operations. Despite many protestations, the edict stood. However, the good news was that he was to head to the then neutral, United States of America on a lecture tour. Among the party were Tuck’s old friend “Sailor” Malan and that gallant Australian, Wing Commander Hughie Edwards VC. Following an enjoyable sojourn overseas, RST took command of the celebrated Biggin Hill Wing on December 1st, 1941. Again, Wing Commander Tuck elected to fly his favourite mount – the Spitfire Mk Vb. This Mk V depicts BL336 on the morning of 28 January 1942. It was in this aircraft that Tuck was shot down by ground fire during a low-level “Rhubarb” mission. It is coded with Tuck’s initials, RS o T, which was an honour accorded to Wing Commanders and above. It also displays his final tally of 29 victories on the fuel tank cover. Tamiya’s Spitfire Mk Vb was the obvious choice for me, as it was on special for AUS$15 in a local store. The kit was “shake and bake” personified, and was a joy from start to finish. Just the thing after a hard day “flying a desk” at work. In late 1941, the Air Ministry directed that fighter aircraft would be painted in a new scheme of Ocean Grey and Dark Green over Sea Grey Medium. The Sky fuselage band and spinner were to be retained, along with the addition of yellow along the wing leading edge to aid recognition. Some aircraft were repainted as they moved through repair depots or in the field. A shortage of the new colours meant that some colours had to be mixed from available stocks. BL336 was an example of the repainting program. I used Polly Scale paints for all colours, mixing the “hybrid” Ocean Grey from Sea Grey Medium and Night on the advice of Bob Swaddling. The “A” scheme became standard in 1941 and the aircraft was repainted with hard-edged colour demarcations. This is clear in many photos of BL336 following its crash landing. The kit was built with only a couple of very minor additions. Cutting Edge supplied the seat (CEC48347). Following the abrupt end to his wartime flying career, he was captured and imprisoned in Stalag Luft III for three years, where he was a leading member of the “X” Organisation. Transferred just prior to “the Great Escape,” he managed to break from custody in January 1945. Partnering a Polish RAF pilot he made his way to freedom via Poland, to meet up with the advancing Russian army. He fought alongside the troops as an infantry officer, before finding his way to the British Embassy in Moscow. He finally returned to England in April 1945. His victory tally at war’s end was 29 aircraft destroyed, 8 probables and 6 damaged. Following refresher training on Harvards, WGCDR Stanford Tuck flew Vampires and Meteors at Tangmere and West Raynham. He received his final decoration, the United States DFC, on 14 June 1946. Posted as Station Commander of RAF Coltishall, then to Singapore, he retired from the RAF in 1949, becoming a successful mushroom farmer and businessman. He passed away in 1987 at the age of 70. WGCDR Stanford Tuck’s official score has now been amended to thirty confirmed victories. Having been out of the hobby for a considerable time, I was delighted to rekindle my love of modelling with this project. Bob Stanford Tuck has always been a hero of mine and I was delighted to finally add his aircraft to my collection. Peter, for his approval to use items from his excellent website; www.stanfordtuck.com and of course, Brett Green - for making my models look much better than they really are!